Triumph presents a collaborative runway with the Singapore Jewel Fest 2015. Pictured here is the bespoked piece from Esvara Viva. Triumph dazzles with their luxurious Essence line during the Singapore Jewel Fest 2015. It was a night of splendour as their seductive pieces made their way through the crowd with some of the best the festival had to offer. Two bespoke pieces from Esvara Viva and Hans D. Krieger were the focus of the night, along with other grandeur designs from the likes of Rota E Rota, Kavant & Sharart and Erich Zimmerman. 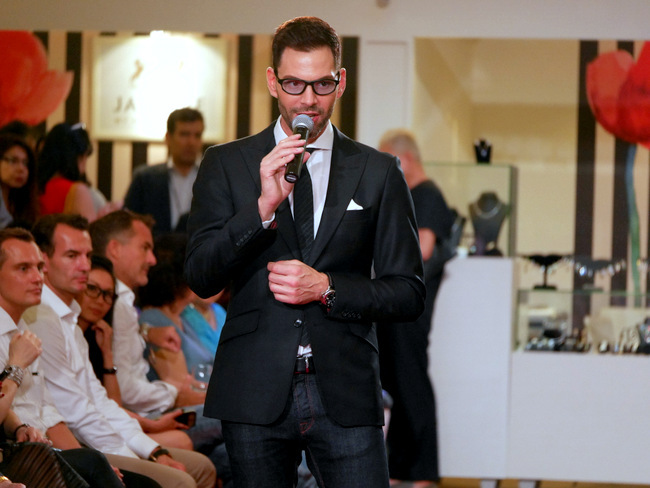 Bobby Tonelli played emcee to this beautiful event. Here are some of my favourites from the night! Triumph Essence at Singapore Jewel Fest 2015. Luxurious pieces may seem too far off for the younger ones but these sweet designs say otherwise. Precious gemstones in bright colours and pearls were kept understated, without taking away from the stars of the show – a.k.a. the lovely models in their Essence line. Stacking these statement pieces might seem daunting to me but these designers have it down pat. Though, those pearls from Singapore-based Simone Jewels (left) could only be pulled off by the Queen. What better way to draw attention to your stunning neckline than one of these? I would love one too, especially the red carpet-worthy piece from Gemayel Jewelry (right). Those who love to go big will love Erich Zimmerman’s stunning yet elegant piece made completely of gold. Triumph presents a collaborative runway with the Singapore Jewel Fest 2015. Pictured here is the bespoked piece from Hans D. Krieger. Hans D. Krieger Fine Jewelry presents Hypnotic Seduction. This design was inspired by Micheal Fabers’ novel ‘The Crimson Petal and the White’ protagonist: a seductress named “Sugar”, which explains how the jewelry was made to focus on the most delicate parts of the female body. Featuring 18K Palladium White Gold, with 3181 Brilliant Cut Diamonds worth 99.85 carats and 22 Red and Pink Tourmalines totaling 157.02 carats, it totals up to S$925,500. And, if you’re ready to splurge, it is actually on sale! Triumph is holding a “Find The One” campaign to help women realise their true size. Find out more here.